We are a leading Manufacturer of u-tip hair extensions from Mumbai, India. Backed by rich industry experience, we are affianced in providing a qualitative assortment of U-Tip Hair Extensions. Offered hair extensions are processed by talented team of professionals with the implementation of ultra-modern machines in tandem with the industry quality guidelines. 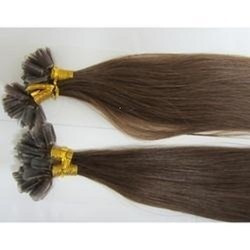 We offer these hair extensions in different colors and shades. Moreover, these hair extensions are broadly cherished and demanded for their natural sheen and voluminous nature.